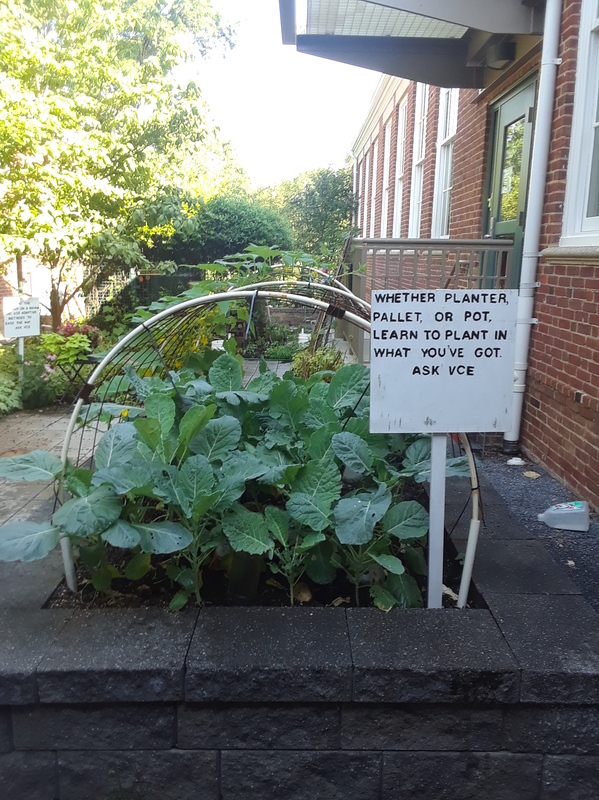 The Teaching Garden is tucked into an alcove behind the Fairlington Community Center (FCC), the long-time home of the Arlington and Alexandria branch office of the Virginia Cooperative Extension Service (VCE). It is one of several horticultural learning opportunities which Arlington County included in the FCC redesign master plan at the VCE’s request. Constructed as part of the FCC renovation in 2007, the Teaching Garden has two large raised beds and several in-ground planting areas. Wide walkways provide space for containers and a bench under a shade tree near the back entrance offers a quiet place to sit and relax. Another view of front raised bed. In 2014, plastic hoops were added to the raised beds. The hoops support fabric row covers that extend the growing season in the spring and fall. In the summer, vines grow on the hoops, shading other vegetables growing underneath. A cistern, installed in 2018, stores rainwater collected from the FCC’s roof to help water the garden. Since its conception, the Teaching Garden was intended to serve as an “edibles training area.” Three Master Gardener (MG) interns from the Class of 2012 were the first to complete an intern project in the Learning Garden. They planted a “world garden,” reflecting the diversity of herbs and spices used by different ethnic groups living in Alexandria at that time. In 2013, an herb and container gardening class for senior citizens for whom English was a second language had the unintended benefit of helping the seniors build English-language skills, as they shared how Teaching Garden plants were used in their native countries. The Teaching Garden also has hosted classes in topics such as wreath making and cold-frame construction. The Teaching Garden is constantly changing. In the winter visitors may see cold frames and other techniques for direct sowing garden plants in cold temperatures. Summer may find plants growing in commonly available containers such as 5-gallon buckets and pallets, or self-watering tools made from clay flower pots and glass beverage bottles. Modeled after the popular Burma Shave signs of the 1950s, new signs call attention to garden features, and direct visitors to the VCE office for additional information. In fall of 2018, Extension Master Gardeners and trainees installed a cistern to collect rainwater for watering the garden. The Teaching Garden is located adjacent to the loading dock behind the FCC, 3308 S. Stafford Street, Arlington, Virginia. Entrance is through the FCC or by an outside gate. Note that the door from the FCC is self-locking so visitors entering the Teaching Garden from the building must exit through the back gate.